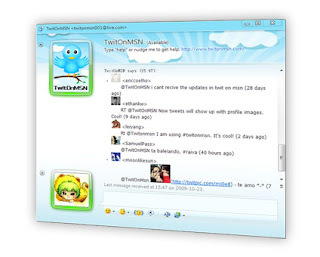 TwitOnMSN lets you simply follow friends' updates and send update directly on your Windows Live Messenger (MSN Messenger). TwitOnMSN is a robot based on MSN, no client install needed. Every message you send will be updated as a tweet on Twitter. You will immidieltly receive updates from people you are following. You can use most of the commands of Twitter, such as @reply, D for direct message, follow/unfollow people, etc. TwiOnMSN supports TwitPic, TwitterKeys, bit.ly / j.mp, and more. You can use it on Windows Live Messenger and other clients, such as Digspy, Meebo, etc. Then follow the information given by the robot to continue.